Happy Monday Jet Setters! Hope you all had a great weekend! For those of you that follow Jet Set Smart on Twitter, then you should know that JSS went to check out a quaint little town this weekend...Cold Spring! 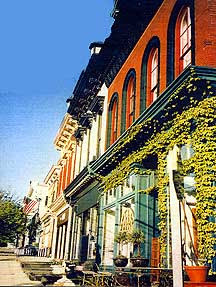 The little town of Cold Spring, New York is located about an 1 and 1/2 drive north of New York City. It's a great town with lots of antique stores, boutiques, cute little restaurants and cafes that is a perfect destination for a little weekend getaway. Have any of you guys been there? It's located on the Hudson River and is nestled right in the mountains. It's such a beautiful place, and I couldn't believe as someone who grew up in New York City, that I've never been. I'll tell you more about where we stayed and what we did on our little overnight trip tomorrow...stay tuned!